Remembering a writer, father, and friend. 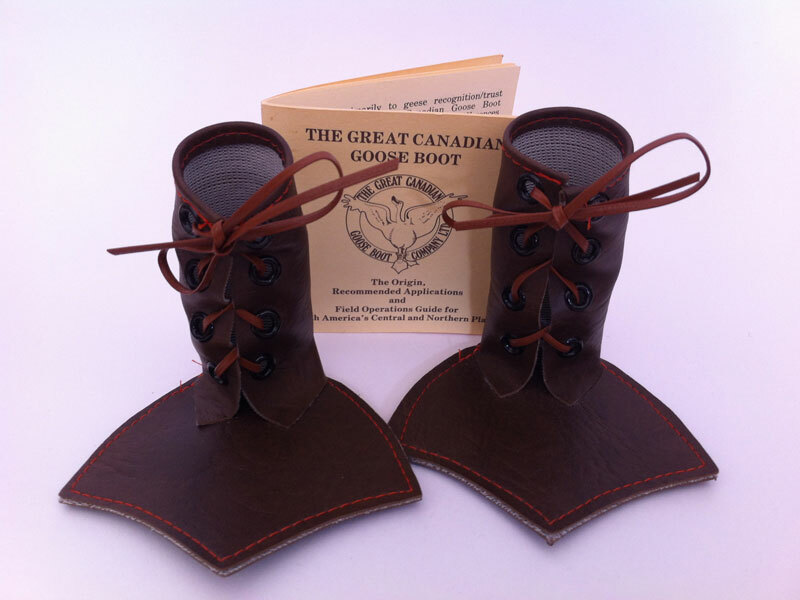 The Great Canadian Goose Boot Company Ltd. These early-1980s novelty items were invented by Brian and Shirley Hoogeveen of Cabri, Saskatchewan, and their American friend Russ Wester. My father came on board through Perry Lumby Advertising, the Saskatoon agency for whom he worked at the time. His involvement was limited to the writing of this “Field Operations Guide”, which was included with every pair of goose boots. Shirley Hoogeveen has been in touch with me and has no memory of my father. I can’t verify how much (if any) of this origin story was his invention and how much came from the founders. With Shirley’s permission I’m leaving this page up as a resource for future historians curious about the origins of the Great Canadian Goose Boot Company. That was the year Russ Wester, an American from Wisconsin, first ventured north to Saskatchewan, to hunt the magnificent Canadian goose. Russ had an excellent shoot and made his northern hunting trip a regular annual event. Over the next few years, however, it became increasingly difficult for Russ to bag a goose, let alone bag his limit. It seemed to Russ that the geese weren’t landing anymore. Not just near him, but anywhere. Other hunters were mentioning the same thing. The more Russ mulled over the problem the more he became convinced that the geese weren’t landing due to damage inflicted upon their feet by the cactus-like, semi-frozen strands of straw. That night, while Russ slept, Shirley designed and manufactured the first pair of goose boots, much to the delight and appreciation of Russ the next morning. Russ and Brian were in the field early and after a few unsuccessful attempts finally managed to capture a goose and fit it out with boots. The boots fit. The two were proudly leading the goose back to the car to take it home and show Shirley the result of her handiwork, when the goose suddenly lunged, snapped the binder-twine and with two short hops was airborne, winging his way into the early morning mist hanging over the field. Dejectedly, Brian and Russ returned home to tell Shirley of their bad luck. Sitting in the comfortable farm kitchen, sipping a cup of coffee, the three were discussing whether Russ should cut his hunt short and return to the States when their conversation was interrupted by what sounded like an on-rushing locomotive. Rushing to the back door the three saw a sight they’ll never forget. Clouds of geese, at times completely blocking out the low-lying morning sun, were swooping down to land in the back yard. Within fifteen minutes the geese were packed shoulder to shoulder (with some late arrivals even precariously perched atop their brethren) as far as the highway, some 300 yards away. As for noise, well, you can imagine. With the appearance of the three on the back porch a sudden stillness settled over the flock. A thin aisle slowly opened in the middle of the geese and the three on the porch were totally flabbergasted when the goose they’d captured earlier that morning suddenly appeared. The goose slowly stretched to full height, swiftly preened down some wayward tufts of down, and marched majestically toward the people on the porch, accompanied by a gentle hissing of the massed geese and, here and there, some polite wing tip brushing which looked and sounded suspiciously like applause. It was about a 150 yard march, and the goose made the most of his entrance. Each goose-step was precise. His leather boots swung rhythmically in and out of view as with chest outthrust he advanced upon the trio until he’d reached a point about 20 feet from the porch. Suddenly he leaped into the air and, beating his wings at a frantic rate, hovered at a point about seven feet up. At the same time the assembled geese lifted their wings and, in the minds of the three bemused humans on the porch, pointed to the goose boots worn by the still frantically windmilling goose. They held the pose for a few seconds and then with a suddenness that was amazing as well as a little frightening, the entire flock charged towards the farm house and then were airborne. Russ, Shirley and Brian stood dumbfounded on the steps for a few seconds while errant feathers and wisps of down fluttering in the turbulence left in the wake of the departing geese settled slowly around them. Russ was the first to break the spell. Leaping off the back porch, arms thrust skyward in a gesture of triumph, he let out a bellow that scattered the few brave chickens that were just now cautiously approaching the back yard. The next morning, following a full night of goose boot production, Russ placed a dozen pairs of goose boots around his usual hunting blind. Within minutes he was surrounded by hundreds of geese fighting to get at the boots. The rest of course is goose boot history. For while the geese were trying on their boots, Russ easily shot his quota of birds for the day. The next morning, curious to see if the goose boots would work on a different flock, Russ approached a new field, leaving a couple pairs of boots in various locations. After returning to have an early breakfast with Shirley and Brian, Russ returned to the field armed with the remaining pairs of goose boots he’d stripped from his “shoot” of the previous day. After scattering them in a circle pattern of roughly 50 yards around where he intended to make his stand, Russ knelt down on a gunny sack to await developments. Within minutes the geese started arriving and within a few minutes of their arrival, Russ had again bagged his limit. The next morning was a repetition of the first two and Russ, Brian and Shirley knew they were on to a revolutionary approach to successful Canada goose hunting. Russ and Brian, in the initial year following the formation of the Great Canadian Goose Boot Company Ltd., were suggesting to all hunters that they concentrate on the birds with the boots in order to get them back for subsequent hunts. It turned out that those geese who did get away with their boots on actually ended up advertising them among other members of their respective flocks. As well, by the following year the geese who had escaped with boots were in need of new boots and were in the vanguard of those fighting for new boots, thereby allowing hunters a chance to bag a more mature and larger bird. During the first three years of our company’s existence we advised hunters to place the Great Canadian Goose Boot within 10 feet of water-edge. We now admit we erred. Field research over two seasons has validated the observations of many of our customers: Geese were finding it difficult to put their boots on while their feet were wet. We are now recommending that placement of the boots be at least 35 feet away from water-edge or, as some Kansas customers are employing to great effect, order our special chamois Goose Towel (with free Goose Towel Rack) for locations where topography mitigates application of proper distances. Proper depth of the towel rack is still a matter subject to heated debate between Canadian hunters who swear by 18 inches and their counterparts in Kansas who feel 14 inches is sufficient. Preliminary research by our biologists seems to favor the Kansas depth due primarily to geese recognition/trust factors, but The Great Canadian Goose Boot Company Ltd. feels that perhaps climatic differences account for variations and both depths might be equally valid. While hunting in the grain fields the goose boots must be placed within 3 feet of the goose pit or blind and no less than 5 feet apart. This recommendation comes from our biologists who know that the goose needs a minimum of a 5 foot circle to allow for wing movement in order to keep its balance while putting the boots on. Our research also indicates that placing the boots within 3 feet of the blind helps to minimize disturbance when the hunter picks up the birds he shoots. The GCCB Co. also emphasizes the use of no more than 15 pairs of goose boots per hunting party. The Great Canadian Goose Boot Company knows beyond a doubt that the goose boots must be placed in the field with the lace completely removed from the top two eyelets and left loosely in the bottom two eyelets. We know that our Kansas customers claim some success by leaving the lace out of only the top eyelet but they also admit that far too often the goose gets his boots tied on and flies away before they are able to bag him. Our research biologists have also proven that if more than the top two eyelets are left open the goose will sense the boots as a trap and will not venture close to them. Hi I am the Shirley that made the first pair of goose boots. We have moved to Alberta and would love to speak to you. I do not know a roger warner. Hi, Shirley. I’m glad you found the site. I searched online for information on the Great Canadian Goose Boot Company before I created that page last year, but I found nothing except a few eBay listings for people selling their Goose Boots. I hope you’ll provide more background. Here’s what I know. My dad worked for an advertising company called Perry Lumby in Saskatoon in the early ’80s, along with Ray Statham, who I believe designed and illustrated the goose boot logo. (For many years I had a t-shirt with the logo on it…my favourite t-shirt.) I got the impression that my dad and Ray were also involved with the marketing and promotion of the goose boots. Or maybe it was a project of the Perry Lumby team and their involvement ended with the writing and design of the packaging. I seem to recall my father telling me about the inventor of the goose boots doing some media appearances in the States…but these memories go back decades. I’m still in touch with Ray, he might remember more. But obviously you know more about it than he would. I just read your email and a few things I think are incorrect. I can’t remember who designed the logo, we had two but it was someone from Saskatoon. Brian, myself, and Russ Wester from Duluth, Minnesota, did all the promoting and advertising. We heard that there were goose boots for sale after we quit selling but we never found out who it was. It was a fun project that went crazy for a few years. The goose boot job was always a bit of a mystery to me. I only remember meeting the founder once. He was a guy that just seemed to wander in and wanted to know what to do to sell some of his odd boots. From the beginning, I remember your dad being enthusiastic about the project. In fact he seemed to be over the moon about it. His imagination unravelled with possibilities. I didn’t see much of a role for myself other than a few cartoon-like drawings and a bit of text layout, which it turned out to be. I can still remember, though, your dad telling me his latest ideas and giving me bits to read. When I read the text again that you posted on the website, it didn’t seem to have your dad’s voice behind it. He was always talking to me or showing me bits he had written about this goose detective and his adventures. … I’m not convinced your dad wrote this text. His version might have been changed by the founders or someone they hired later. Hmm. Among my dad’s papers is a hard-boiled detective parody about a dog detective and a goose femme fatale that I believe was meant to be a chapter of a longer and never-completed novel. I never put it on the website because I didn’t think it was all that good, but now I’m wondering if A) maybe you’re getting this entirely unrelated story mixed up with the goose boot origin story, or B) maybe it actually evolved out of, or simultaneously with, an earlier draft of the goose boot origin story. Who knows. Brian was definitely the writer of the booklet. He was always a very creative writer. He spent the better part of the winter getting this project off the ground. We had a small four seater plane at the time that he used to get around. We had the booklets, boxes, ball caps and t-shirts made in Edmonton and Calgary. We had the boots made in Swift Current at the sheltered workshop until we couldn’t keep up with demand. Then we had a factory make them in Winnipeg. Before all this we had a place in our basement making the boots. I sewed the boots, Brian’s dad put the eyelets in, Brian’s mom laced the boots and our kids put the boxes together and put everything in the boxes. We had quite the assembly line. Brian did many radio talks and even made the national news with Gordon Vissotti from Regina. They did a commercial down by Wascana Lake. I have it on tape somewhere. Like I said before, we had lots of fun with this project. We were in our late twenties. This is a DELIGHTFUL story. I would LOVE to own a pair of goose boots. Are they for sale anywhere? I still have my goose boots!. They are on my computer table. People still ask me what they are. They came with us when my husband, Elmer, and I went to Saudi Arabia. I was asked to give a talk about them to our company ladies group. It was very well received! Great memories.